German dictator Adolf Hitler's Nazi party “actively worked to destroy Europe's Jews financially” and nearly a third of the German war effort was paid for with money stolen from Jews according a new study about the role of the German Finance Ministry during the ‘Third Reich’. A commission of historians found that bureaucrats at the Finance Ministry in Berlin were more involved in the persecution of Jews under the Nazis than was previously known. Ministry officials robbed an estimated 120 billion reichsmarks [the equivalent of nearly US$ 20 billion today] by looting and through stringent confiscation laws. Ullmann suggested that the role of the Finance Ministry had not been scrutinized by Germany as much as other factors concerning the Nazi era. "What was obscured behind that image was the indispensable contribution made by the Reich Finance Ministry toward the functioning, the stability and the criminal policies of the Nazi regime," he said, according to the ‘Reuters’ news agency. The report now released by the commission also suggested that bondholders of German debt were aware their money was being used to further the goals of the Nazis. 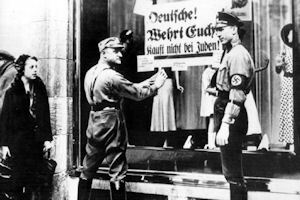 Tax laws discriminated against Jews from 1934, while some who managed to leave Germany before the Holocaust had much of their wealth seized through an ‘exit tax’. Nazi officials seized and sold the property of Jews who fled or who were sent to the death camps, both in Germany and in the nations the Nazis occupied during World War II.